The Spectra Precision 24X Air Dampened Auto Level AL24A-1, AL24A-2 and AL24A-3 Packages are designed for a variety of elevation control and alignment tasks including general building construction, cut and fill measurements, area leveling, and landscaping. 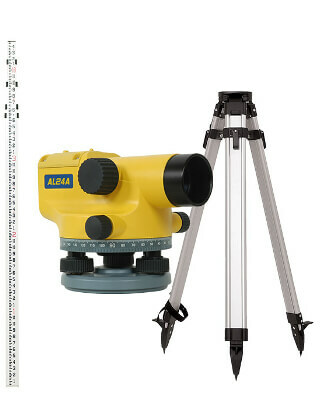 Each package features a durable Aluminum Tripod, and an Aluminum Grade Rod which is available in 16 Feet with Graduations in Tenths (AL24A-1), 16 Feet with Graduations in Inches (AL24A-2), or 5 Meters with Graduations in Metric (Al24A-3) in addition to the Spectra Precision 24X Air Dampened Auto Level AL24A which features reliable automatic compensators to ensure stability and accuracy in the line of sight. In addition, the telescope optics on the auto level are bright and clear providing sharp images for ease of viewing, a short focusing distance provides for better performance in tight spots or on steep slopes, stadia lines on the reticle make distance calculations easy and the horizontal scale directly below the eyepiece makes angle measurement quick and convenient.